Are you ready for another day of My Creative Time sneak peeks? 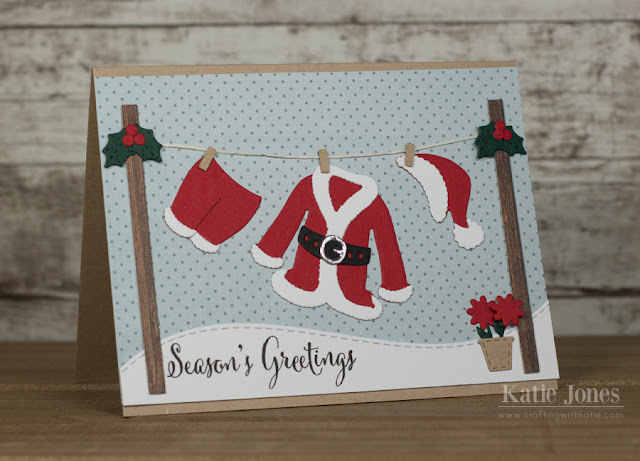 Today we have another fun new set to share with you called Santa Suit Dies! This is the cutest little set of dies that will let you create a fun little Santa suit! I thought it would be really fun to use these new dies to make all of the parts of Santa's suit and hang them on a clothesline. Isn't that suit just the cutest? To make the clothesline, I just used my Cricut Explore to cut rectangles the size I needed for the clothespins and wooden "poles," and I strung some hemp in between the poles. I decorated the poles with some holly and berries made with dies from Holiday Tags, and I added a little flower pot made with dies from Way to Go. To make my snow bank, I used one of the More Stitched Edges Dies, and the sentiment is from Winter Cheer. I see a theme popping up with this darling little Santa suit set. So adorable! The little details are the finishing touches!Super cute card! YOU so did a Super Outstanding Creative job!! I love it...YOU so ROCK!! Oh I love this! This is so cute!!!! I can so see a lot of people thinking to do a clothesline for this die set! Love your clothesline poles and the pretty holly too! Katie, love this card! Imagine all those Santa suits out there during the holiday season that need to be aired out! Awesome! Sweet card. Love the Santa suit! I am just loving these Santa suit Cards, yours is adorable! Okay, this is seriously the cutest card! I love this set and you showcased it perfectly! LOVE, love this! Such a wonderful holiday card. I love the festive & fun details. I absolutely love the sentiment! Katie ~ EEK!! ADORABLE!! Okay hanging the Santa suit out on the clothes line is seriously such an ADORABLE idea! Then you created the sweetest little scene EVER!! your card is my fav , I love all thelittle extra touches you put on it,the flowers and holly stc!!! beautiful!!! This card is so adorable! I love the way you hung the suit on the line. Too cute for words! Super cute card! I love all of the little details - the flower pot, the holly,.... cute! This is another must-have set! What a sweet scene and clever way to make posts and clothes pins. I love how you decorated with holly and the little pot was a cute touch. Love your sweet clothesline scene! Such a fun set of dies! Lovin' this release! I love the holly on the pole!! Super cute scene you created!! Love your darling clothesline with the holly and poinsettia. Great idea. This scene card is amazing. Just love the poinsettia and holly on the poles. Ms. Katie, this is just too cute! Love your card. Great job on your card today I can't wait for the release! Adorable clothes line! Love the snowy hill on the bottom too and how you put the line between the 2 poles with the holly! You did an amazing job with this new set! Love it! This Santa Suit On The Clothes Line Card Is So Adorable!! Just Loving This Die Set!! Wow, that is so cute!! What a cute card! This set is really neat. Thanks for the chance to win. MCT 60th Edition Release Blog Hop!